Hi guys! Since you really seemed to like my P2 post from last week I thought I would show you another pretty I bought from them recently. This is actually a really funny polish and even though it probably isn't unique I hadn't seen a polish like this before. The picture below is the same bottle, photographed twice and put in one image and I think you can probably guess by the name, what's going on here! 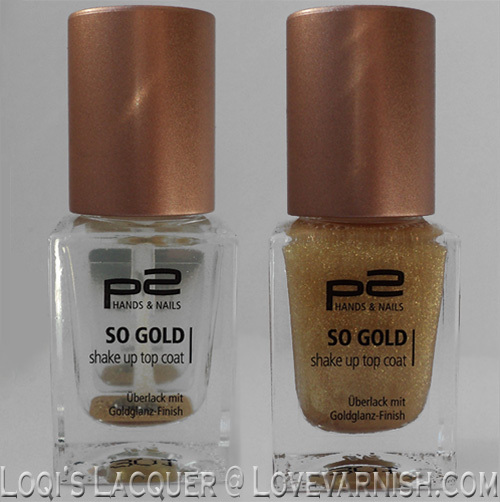 P2 So gold is an effect topcoat that needs to be shaken for optimal effect. As you can see from the bottle on the left, the gold particles (it's not real gold btw) are very heavy and settle on the bottom of the polish. You can actually use it like this to get the tiiiiiniest hint of golden shimmer, or, you can shake it up for maximum sparkle.This polish is not like the different brands of 'gold leaf topcoat' that are available. It doesn't have big flakes of metal. Instead it has fine shimmer particles that are just a bit larger than normal shimmer. For this manicure I used a base of China glaze Let's groove and applied one coat of So gold. When shaken this topcoat is very dense and one coat gives a wonderful rich effect. So gold has quite a watery consistency but it's not runny at all. It applies very easily and evenly so you don't have to worry about getting an uneven layer of the gold. Removal is very easy as well, the particles act like normal shimmer, even though they are a bit larger, and don't end up all over your hands. I really like the look of this topcoat. 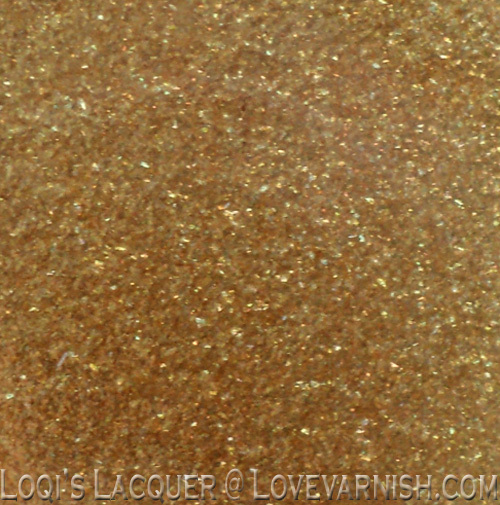 The gold is very sparkly and clear and I love the effect over a darker polish, it looks so luxurious! What do you guys think? Do you like this look? Or do you prefer a gold leaf topcoat instead? Tell me in the comments, and see you next week! OH MY, this is just stunning! The result reminds me of Zoya Sansa, actually! I'd play with the bottle all day long ^^. :O you are right, it does! I wanted Zoya Sansa so bad, but I didn't even see I recreated it. Not sure I need it anymore now :D thanks! Playing with the bottle is a lot of fun! It does take a little while for the gold to settle completely tho, but it's very satisfying to shake it up again! I really like the idea of being able to use a little or a lot without having to layer up on loads of coats. Holy cow this is AMAZING! This is really pretty! When I saw it on the nail, it wasn't what I expected, but I love it! At first I thought "wow what a cool idea!" but the more I think about it, the more this seems like "well, the particles sank to the bottom, what do we do now?!" Haha. Either way, your swatch is gorgeous! This looks so pretty over that dark purple shade! Wow, what a nice color combo! This is such a gorgeous combination! Ooh pretty! I love how awesome it makes the base color look! Oh that looks soo good over that purple! Wow! This is really amazing. I love the subtlety of the small gold particles like this. The gold flakes can be more abrupt and I like how smooth and sultry this looks! No not really glitter, but the irregular bits of gold leaf that are popular now, like in OPI - Man with the golden gun. :) would they look nice when applied together? Thanks Phyrra! <3 You are always so nice! I was very curious the first time I used it, I didn't know what to expect either! Thank you! I was really happy with how it turned out. Joyce mentioned below that it is similar to INM Out The Door Northern Lights Gold. But that one is a lot less dense. Thanks Valesha! I was really happy with how it turned out! <3 such a nice thing to say! Thanks so much! Very pretty! I really love the effect. That's a nice description, thank you!